1. 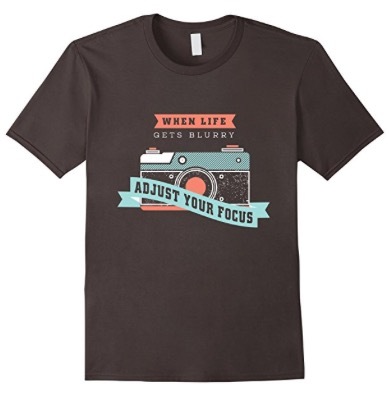 Adjust Your Focus T-Shirt: Photography Bay’s very own t-shirt design with men, women and youth sizes available from Amazon. 2. Memory Cards: No photographer ever really has enough memory cards. The most popular types of cards are CF cards and SD cards. You need to make sure you get the right one for your camera. I recommend using Lexar Professional, Transcend or SanDisk Extreme UHS-I type memory cards. For a better understanding of what to look for in a memory card, see my prior article Demystifying SD Cards. 3. USB 3.0 Memory Card Reader: As we chew through more and more data in our cameras, it takes longer to pull images and video off our cards. A USB 3.0 memory card reader helps get it off there faster thanks to a much faster throughput from USB 3.0. It’s also a pretty cheap thing to upgrade and makes a great stocking stuffer. 4. Joby Gorillapod SLR Zoom: It’s a great little portable tripod for DSLRs and mirrorless cameras up to 6.5lbs. 5. Pelican SD Card Case or CF Card Case: My above suggestion of more memory cards directly relates to a better organization system. These are tough, polycarbonate memory card cases that are water resistant. 6. Camera Remotes: Every photographer needs a camera remote every now and then. They are available for virtually every enthusiast-grade camera out there. 7. Batteries: Photographers like accessories and accessories use batteries – especially AA batteries, which are used in everything from camera flashes to wireless lav mic packs. Even if you’re just buying bulk disposable batteries, it’s worth ordering these before Christmas morning. 1. Fuji Instax Cameras: One of the most enjoyable photography purchases I’ve made in the past couple years has been a Fuji Instax camera. There a couple kinds: the Instax wide-format are close to the old-school Polaroid instant film size; and the Instax Mini cameras are about half that size prints but the cameras are also much smaller. Did you know that the Fuji Instax Film was the number one seller in the Camera & Photo department last holiday season on Amazon.com? Also, check out my review of the Fuji Instax Mini 8 and my review of the Fuji Instax 210 wide format camera. 2. 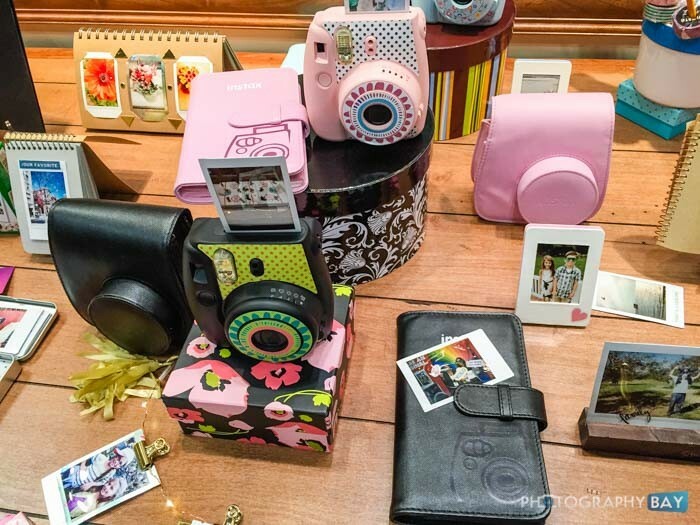 Fuji Instax Accessories: There are loads of accessories for Instax cameras because of their growing popularity. Along with the official accessories you can buy at major retailers, also take a look at places like Etsy for some really cool albums, stickers and display accessories. 3. Used Film Cameras: You can find some fantastic film cameras for very cheap if you are willing to look at used offerings. Over the past couple years, I’ve bought some great medium format and 35mm film cameras on ebay and at local photography shops and thrift stores. If you are buying from ebay, make sure you do your due diligence to determine that the seller has a history of positive feedback and that you thoroughly read the description and examine the photos. 4. Lomography: There are tons of Lomography cameras, films and accessories for a budget-oriented approach to film photography. 1. 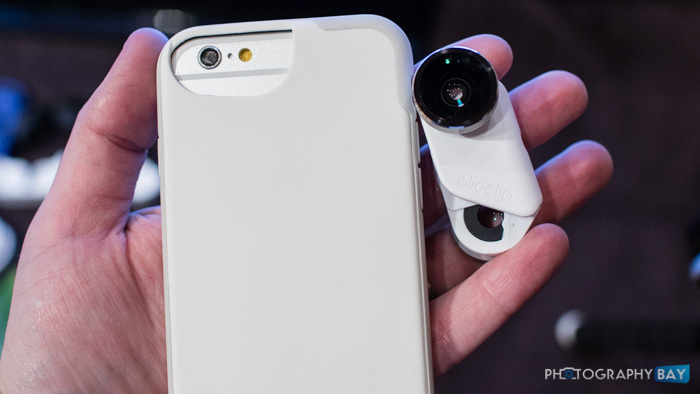 Olloclip Lens Accessories: Olloclip offers a full line of accessories to enhance the photography and video capabilities of your iPhone and Samsung Galaxy. The best accessories are the 4-in-1 lens kits that give you several different lens options like wide-angle and telephoto for your phones native camera lens. I particularly like the OLLOCASE and lens kit for the iPhone 6/6+. New accessories for the iPhone 7 should be available soon. 2. Smartphone Tripods & Mounts: Joby’s GripTight line allows you to mount a variety of smartphones to any tripod. Joby MPod Mini Stand is a quick and easy tripod that works with most smartphones. 3. Waterproof Cases: There are a ton of waterproof cases available from Lifeproof for the iPhone and Samsung smartphone lines. On the lower-end, there are some simple dry bag kinds of cases that can perform well for not much cash. 4. Fuji Instax SHARE Smartphone Printer SP-2: There aren’t many convenient ways to get instant photos from your phone’s camera. Several printers claim to be compatible with smartphones; however, few execute it well. The Fuji Instax SP-2 is one that gets it right. With the quality we can get out of our smartphones nowadays, the basic compact camera market doesn’t quite offer as much advantage as it used to; however, certain users and/or situations still call for a dedicated point and shoot camera at a reasonable price. 1. 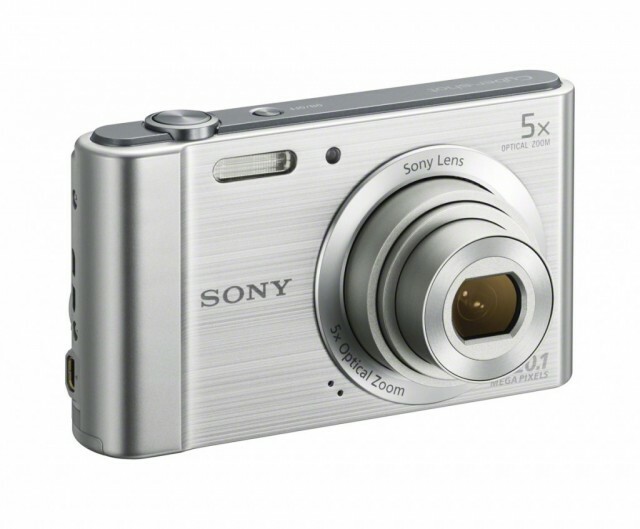 Sony Cyber-shot W800: Sony still makes great point and shoot cameras – even the inexpensive ones. The W800 features a high-res 20MP sensor, a 5x zoom lens (26-130mm equivalent) and optical image stabilization, which is something you don’t see in many sub-$100 cameras. 2. Canon PowerShot ELPH 190 IS: Another decent compact camera, the ELPH 190 features a 20MP sensor, a 10x optical zoom (24-240mm equivalent) and optical image stabilization. 3. Nikon Coolpix S7000: A highly-regarded compact camera at a fairly cheap price (around $200 or so). It has more features features than the above cameras, but still maintains a simple design. 1. GoPro HERO4 Black Edition or Silver Edition: While the GoPro HERO5 has just been announced, early reports are mixed. The GoPro HERO4 is a proven and reliable model. And, with the new HERO5 out, the HERO4 models are available at a discounted price. The Black Edition shoots 4K video, while the Silver Edition includes a touchscreen LCD and shoots 2.5k video. I personally own the Silver Edition and LOVE it. The touchscreen has me using this camera so much more than I otherwise would. See the full rundown on these models on here. 2. YI 4K Action Camera: YI’s 4K Action Camera looks a bit like a GoPro knockoff; however, it has a rabid fanbase and comes in at a discounted price for the specs and performance that it delivers. 3. Sony FDR-X3000 Action Camera: Sony’s new top-of-the-line X3000 action camera looks impressive and will ship in time for the holidays. However, at $549, it’s at the top of the budget for action cameras. 4. 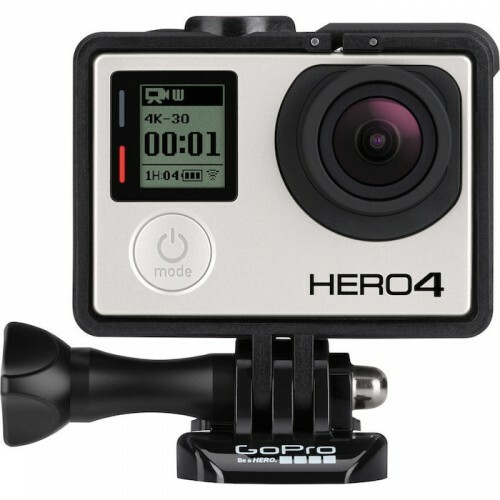 GoPro Accessories: I could fill this entire page up with GoPro accessories but I’ve already done that in an earlier post. Check out 15 Essential GoPro Accessories and you’ll be set for even more stocking stuffers. 1. Sony RX100 V or RX100 IV or RX100 III or RX100 II or RX100: Sony created this market with the original RX100 that features a 1″ sensor. It followed up with four more advanced models, all of which are excellent. They are staggered in price, started with the RX100 at the bottom. The latest RX100 V shoots 4K video with a professional XAVC-S codec for incredible quality. For more, read my review of the Sony RX100 IV and my review of the original RX100. 2. Panasonic LX100: Panasonic’s LX100 offers an interesting twist. 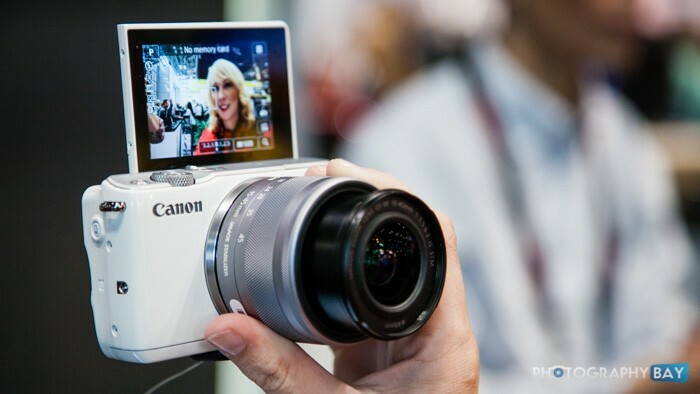 It features a 4/3″ sensor, which is the same as what is found in Panasonic’s much larger, interchangeable lens cameras. It also shoots 4K video. 3. Canon G7 X Mark II: The G7 X follows closely to the specs and features in Sony’s RX100 line. In fact, it uses a Sony sensor that is probably the same one Sony uses in its cameras. Also, consider the Canon G9 X. 1. 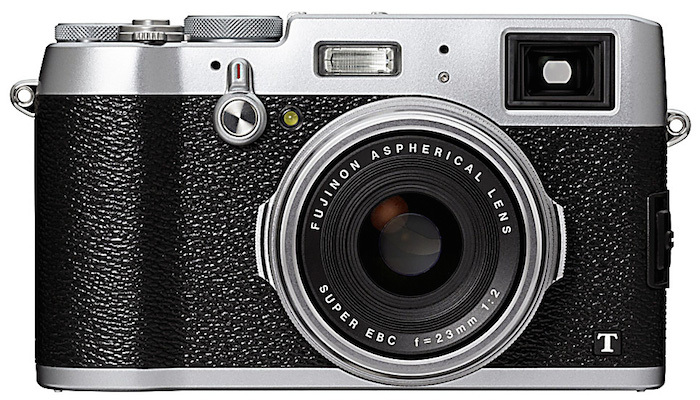 Fuji X100T: It sports a large, 16.3MP APS-C sensor inside of a great-looking camera body and a fixed 23mm f/2 lens. The retro design and solid performance make it an excellent contender for a daily carry camera. 2. Sony RX10 II or RX10 III: If the fixed 23mm lens doesn’t suit your needs, then the RX10 II with its 24-200mm f/2.8 equivalent lens offers the flexibility of superzoom and the image quality we all love from the RX100 models. 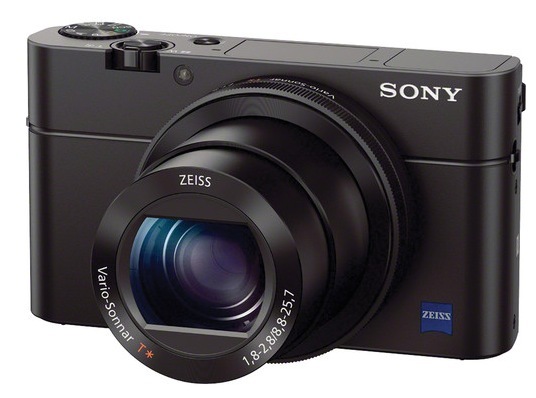 The RX10 II is highly-regarded in its usability as both a stills and a 4K-shooting video camera. And, if you need even more reach, check out the RX10 III, which features a 24-600mm equivalent lens. 3. Panasonic FZ1000: Similar to the RX10 II, Panasonic’s FZ1000 sports a 1″ sensor and a long superzoom lens – a 25-400mm f/2.8-4 equivalent. In addition to 20MP still images, the FZ1000 also captures 4K video and comes in several hundred dollars below the price of the RX10 II. 4. Sony RX1R II: This is the cream of the crop for fixed lens cameras but also is priced high at $3900. It features a fixed Zeiss Sonnar T* 35mm f/2 lens and a 42MP full frame sensor with a variable optical low-pass filter. 1. Canon EOS M10: Canon has tried its hand at several mirrorless cameras but I think the EOS M10 hits the mark better than any of the others have thus far. At $599, it is reasonably priced and a $100 adapter will allow it to work with all of your older EF lenses. For more, check out my EOS M10 review. 2. Sony A6000 or A6300 or A6500: Sony’s mirrorless camera line is firing on all cylinders. The Sony A6000, A6300 and A6500 models are rich in features but still easy to use. The A6300 and A6500 are more expensive but also offer 4K video capture, and the new A6500 delivers an impressive set of new autofocus features. 3. Fuji X-A3: It’s usually Fuji’s more advanced mirrorless models that get all the attention; however, the X-A3 offers that slick retro style while keeping the operation simple and the price low. 1. 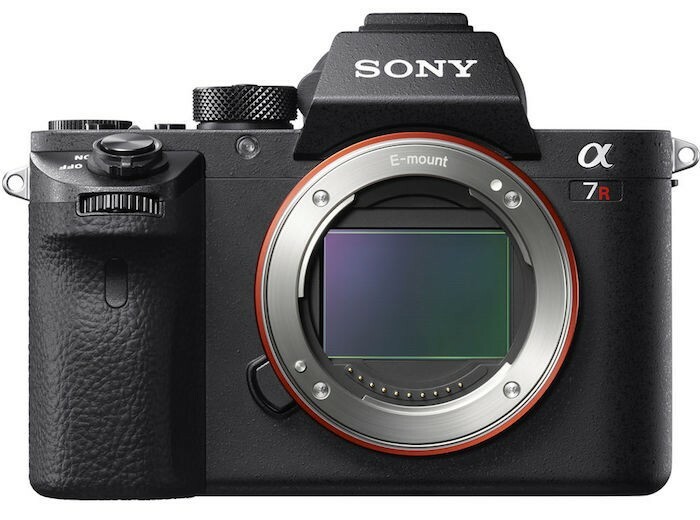 Sony A7S II or A7R II or A7 II: Sony’s A7-Series is still the cream of the crop for mirrorless cameras. With three models from which to choose, the cameras offer something for everyone. The A7S II is a low-light and video-shooting beast with 4K capture. The A7R II is high resolution at 42MP and also captures 4K, while the A7 II is the most affordable and still offers 24MP. 2. Fuji X-T2 or XT10: Fuji’s X-Series line has reached its peak with the X-T2 and the X-T10. While the X-T2 feels more like the professional workhorse, the X-T10 offers a whole lot of the X-T2 in a smaller package and lower price. 3. Panasonic Lumix GH4: While the GH4 offers a mild upgrade on the still image side compared to the GH3, the big buzz feature from the GH4 is the ability to record 4K video in camera. Panasonic offers 4K video now in several product categories and all are available at incredible price points. Panasonic has let us know that the GH5 will arrive in 2017; however, that’s still several months away and the GH4 remains an incredible deal. 4. Olympus OM-D E-M1 Mark II or OM-D E-M5 Mark II or E-M10 Mark II: Fuji isn’t the only one firing on all cylinders in the retro department. Olympus has a solid stable of mirrorless cameras for pros and enthusiasts that range from high-end to lower-end. 1. 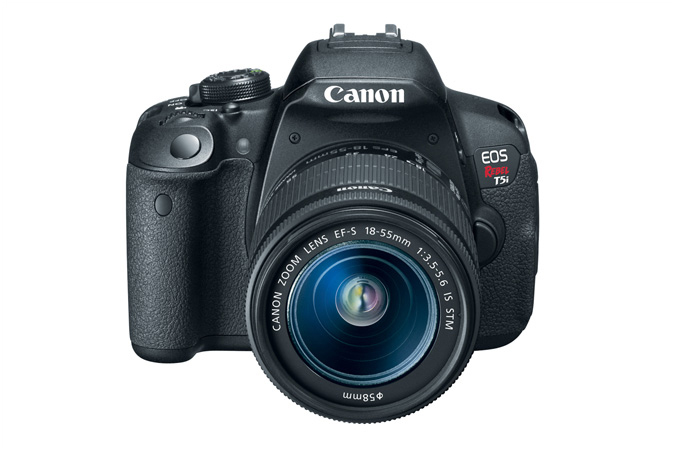 Canon Rebel T6s or Rebel T6i: Canon’s Rebel series is an easy pick for any amateur’s first camera – or even an update to a DSLR that is a few years old. Both of these Rebel models are great and easy to use. Image quality is identical from both cameras as they use the same sensor. The controls, layout and optional features set the Rebel T6s up as a more serious camera for experienced shooters. For more on these two, read my Canon Rebel T6s & T6i review. 2. Nikon D5500: It is basically Nikon’s counterpart to the Canon Rebel series. The D5500 is a fantastic option for a beginner for all the same reasons as the Canon Rebel series. It is an excellent camera with a rich feature set that you won’t soon outgrow, along with outstanding image quality. Read my Nikon D5500 review. 3. Nikon D3400: It is a step down from the D5500 but still offers great image quality with a more restricted feature set suited more toward beginners. 4. Pentax K-S2: Pentax cameras are often overlooked in favor of the big hitters, Canon and Nikon; however, Pentax DSLRs consistently offer excellent build quality and great performance. The K-S2 offers a whole lot of camera for not a lot of cash. 1. Canon 5Ds & 5Ds R or Canon 5D Mark IV or 7D Mark II: The top dogs in Canon’s DSLR line-up. The 5Ds and 5Ds R both feature a 50.6MP full frame sensor and currently reign supreme as resolution kings among DSLRs. 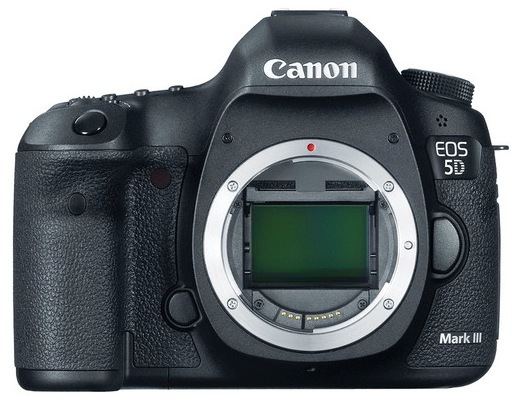 The 5D Mark III is still the full frame workhorse, while the new 7D Mark II is a do-it-all APS-C format DSLR. Also, consider the lower-priced Canon 6D for breaking into the full frame format. 2. Nikon D810 or D750 or D610: Nikon’s trio of full frame cameras, listed from high to lowest price. The D810 is the high-res king at 36MP. The D750 is an action/sports camera at an “affordable” price point, while the D610 rounds it out as a very affordable camera, considering the full frame quality that it delivers. 3. Nikon D7200: An excellent crop sensor camera that is Nikon’s answer to the Canon 7D Mark II in all but the video recording department. For still images, however, the D7200 has the edge. Read my Nikon D7200 review. 4. Pentax K-1: Pentax is often a sleeper hit but the K-1 is the company’s first full frame DSLR and has few, if any, chinks in its armor. If you want a whole lot of camera at a fraction of the price of the major competitors, you’re going to like what you find in the K-1. 1. Photoshop Elements 15 & Premiere Elements 15: These programs will get most photographers and videographers up and running. The first link goes to a combo pack, although you can purchase each separately. 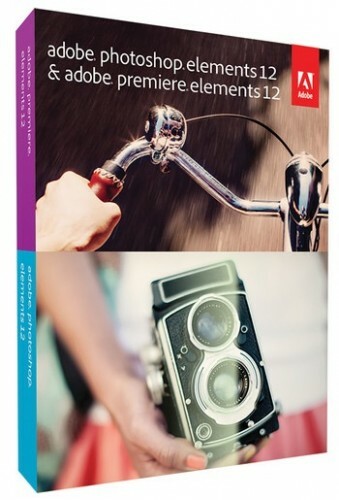 See Photoshop Elements 15 OR Premiere Elements 15. 2. Lightroom 6: The default photo software editor for processing RAW files. Adobe Lightroom 6 is very popular among both pros and amateurs for both performance and organization. 3. Capture One Pro 9: It is becoming the other RAW file image editing program among pros. Camera support is growing and it is knocking on Lightroom’s door. 4. Creative Cloud Photoshop Photography Program: If you want the real Photoshop and Lightroom together in one, Adobe’s Creative Cloud Photoshop Photography Program delivers both, along with several online features, for $120 per year. 1. 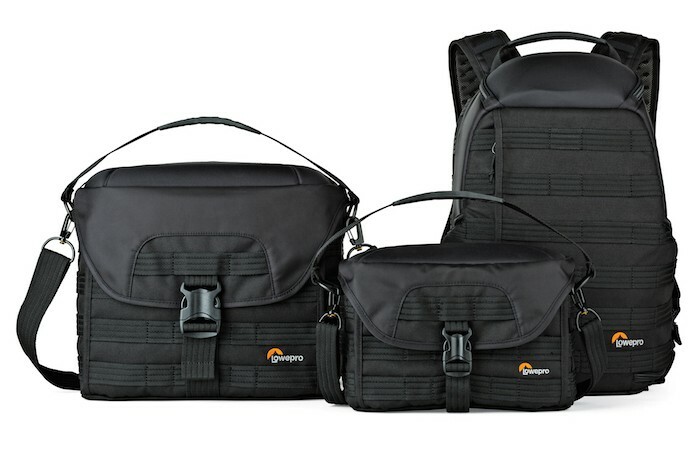 Lowepro ProTactic Series: This bag series is rugged and capable of holding all your gear for a variety of outings. Check out my Lowepro ProTactic 450 AW review. 2. Think Tank Photo: Over the past several years, Think Tank Photo has grown to become a standard for professional photographers. While the bags have typically been blacked-out with a professional look, recent additions offer some more options in the look and target audience. 3. Domke Herald: A great camera bag with a classic look. It’s not cheap, but it is very high quality. Check out my review of the Domke Herald. 1. 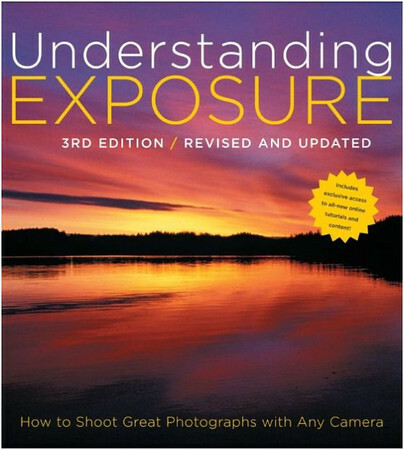 Understanding Exposure by Bryan Peterson: Another great stocking stuffer, no new camera owner should go without reading this book. It’s inexpensive at (around $15), which is a big discount from your local bookstore. If you’re buying someone a camera or getting one yourself, make sure this book goes with the camera. It’ll be the best $15 you spend on photography. 2. Photoshop for Digital Photographers series by Scott Kelby: There are several versions of Photoshop out there, so make sure you buy the appropriate corresponding book. 3. The Camera, The Negative, or The Print by Ansel Adams: Classics from Ansel Adams are still full of relevant information for today’s digital photographers. And, it’s nice to have Ansel’s imagery and advice on your bookshelf. 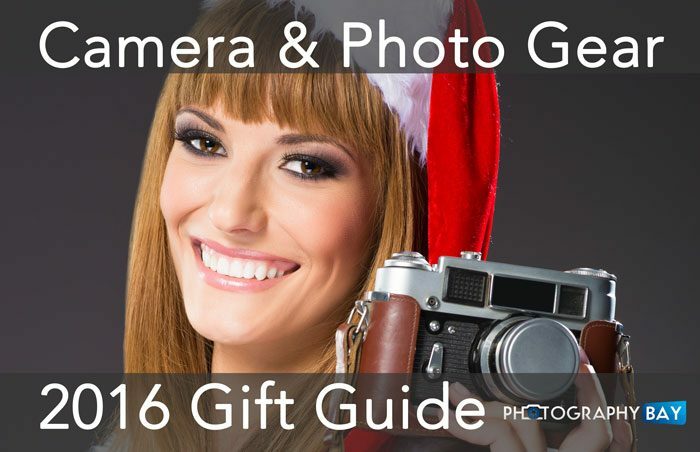 That’s all we’ve got for this year’s installment of the Camera & Photo Gear Gift Guide. I hope this run down gives you a better idea of what to look for when shopping in the camera aisle this Christmas. Also, stay tuned for regular updates from Photography Bay as the holiday season continues. Keep an eye out on our Black Friday and Cyber Monday Camera Deals as we approach that big weekend of deals. By shopping at the retailers using the links in this guide, you are helping Photography Bay to continue delivering quality reviews and other photography-related content. Thanks for your continued support.